Productivity isn’t about the number of things on your to do list. It’s about getting the most out of what you do, because what you do is important. It matters. ‘Busy’ness is keeping us from business. Distractions are eating up to 30% of our day. Multitasking is the only way we can get our job done, right? Then it starts all over the next day. We are stressed. What if multitasking is a lie? What if our brain’s design prevents us from doing two thinking tasks at onetime? What if the personal technology we have come to depend on is slowing us down? In this interactive presentation, you will learn how our compulsion for connection is causing stress lowering our IQ and making us less productive. And how distraction-free focus can lead to extraordinary results. You will leave with a renewed energy, along with methods to manage the constant bombardment of notifications and expectations. You will embrace what technology can do for you while recognizing what it does to you– professionally and personally. And you might have some fun along the way. 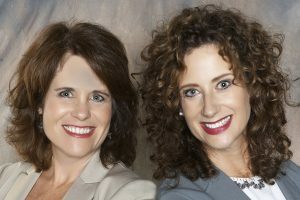 Donna Bayless and Sharon Winter are a spirited speaking duo and lifelong friends who grew up together in Kentucky’s bourbon country, drove white ’65 Mustangs in high school and reconnected in Music City USA to form RightLane. With a PASSION for inspiring change, our presentations emphasize humor, hands-on activities, and current events. Donna graduated from Western Kentucky University with a Bachelor of Fine Arts. She was Vice President of National Accounts for AmerisourceBergen, a healthcare company, has developed software implementation training for hospital companies, and delivered stand-up training and presentations in sales, software, and management development. Sharon also graduated from Western Kentucky University with a BA in Communications and holds a Masters of Education from Belmont University. Sharon worked at Lindsey Wilson College and Belmont in several capacities from Admissions to Development to Online and Continuing Education. She was an on-air hostess for a Nashville real estate show and acted in several movies, commercials, and video and print projects in the Southeast. The East Tennessee Meeting Professionals is an organization that supports meeting professionals with Education, Networking, Business Opportunities, and Leadership Opportunities.